SLEEVE IS VG - RECORD IS EX. Titles are listed below. Sweetheart - VG - Parrot. My Love - 1974 - EX - Parrot. King Of Hearts - 1973 - EX - Parrot. LP: Gigantes Del Pop - Engelbert Humperdinck. Produced in 1981 by Decca, made in Spain. Cover good, a little wear on edges. Record very good, no scratches. Quando quando quando. The last waltz. Am I that easy to forget. This is a very old record that dates back to 1971 and is in excellent condition. 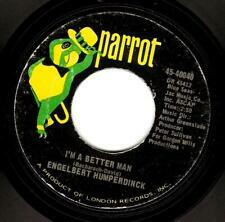 It was distributed by London Records, Inc.
An Album/ LP by Engelbert Humperdinck described as follows Label/Pressing Date: Parrot Records label, pressed in 1967. VG = Very Good . Vinyl has a few surface scuffs and/or very minor scratches (but no ‘feeler’ scratches). Album sleeve, liner, and the record itself are all in excellent condition as pictured. Engelbert Humperdinck: The Last Waltz. Release Date Notes: General wear to LP. Wear and aging to cover. Thomas Charities presents. An Album/ LP by Engelbert Humperdinck described as follows Label/Pressing Date: Epic Records label, pressed in 1981. ; Stay Away; I Don't Break Easily; Say Goodnight. Condition of Record: Nice VG to EX! Album is in good shape. PAS 71015 Stereo. ENGELBERT HUMPERDINCK. Parrot Records. The Last Waltz. RECORDS HAVE NOT BEEN TESTED . This is a used item with normal wear and tear. The Cover appears to have been previously written on. For the Collector is the 3 vinyl lp set by Engelbert Humperdinck. After The Lovin 1976. Sweetheart 1971. Sleeve Grading: Good to Very Good (no sleeve "Sweetheart"). After The Lovin' AFTER THE LOVIN'. An Album/ LP by Engelbert Humperdinck described as follows Label/Pressing Date: Epic Records label, pressed in 1979. Condition of Record: Nice NM! (see notes below regarding grading). Sold as-is. Label/Pressing Date: Candlelite Records label, pressed in 1977. An Album/ LP by Engelbert Humperdinck described as follows Inner Sleeve Included (Yes/No): Yes. Also, includes 16-page photo booklet insert. I/249 We use Goldmine® visual grading. An Album/ LP by Engelbert Humperdinck described as follows Title: "Last of The Romantics". Label/Pressing Date: Epic Records label, pressed in 1978. VG- = Very Good-. Label shows evidence of wear and/or has small amount of writing. (I am not a professional vinyl grader ). Engelbert Humperdinck. Here is a mint copy of this 45. It really looks unplayed. Decca 26.205 Made In Belgium. Picture sleeve is a fold over style. (Artist:ENGELBERT HUMPERDINCK. Label: EPIC 1977. THERE IS NO WAY A "WRONG" LP WILL BE DISPATCHED TO YOU. SO FOR THOSE LOOKING FOR AN EASY SCAM… DON'T TRY HERE! Title: - THE ULTIMATE -. VINYL VERY GOOD -SEE GRADING SYSTEM BELOW). Item: Engelbert Humperdinck - The Last Waltz. Check our other Vinyl LP Records HERE. Remark: This is a Vinyl Record that was released and sold in Japan. An Album/ LP by Engelbert Humperdinck described as follows Label/Pressing Date: Epic Records label, pressed in 1977. Title: "The Ultimate.". MT = Mint. Condition of Record: VG (see notes below regarding grading). D/28 We use Goldmine® visual grading. LABEL : Parrot. COVER CONDITION : generic. Rates for overseas seem to change often and sporadically depending on country. 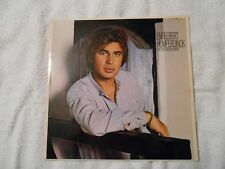 An Album/ LP by Engelbert Humperdinck described as follows Title: "After The Lovin' ". Label/Pressing Date: Epic Records label, pressed in 1976. Condition of Record: Nice VG to EX! (see notes below regarding grading). Readers Digest Presents Romantically Yours 6 Album Set by Engelbert Humperdinck. I have visually inspected every record. No label records are in original sleeve. Record is VG with a few light marks. Both album and Jacket are in nice shape, still has shrink wrap on it. An Album/ LP by Engelbert Humperdinck described as follows Title: "After The Lovin' ". Label/Pressing Date: Epic Records label, pressed in 1976. Condition of Record: Nice NM! (see notes below regarding grading). Engelbert Humperdinck, live at the Riviera Las Vegas. Parrot XPAS 71051 in Stereo gatefold cover and record is excellent. Robert Goulet. Sincerely yours. Columbia 1931 record and cover are excellent. Engelbert Humperdinck - THE ULTIMATE. CONDITION: Record / Cover: NM / NM. Cover has heavy ringwear, longer splits, discoloration, writing, cut-out or punch hole. F = FAIR : all the above only plays without skipping, again rarity makes it worth keeping. Engelbert Humperdinck - I'm A Better Man. Label: Parrot. Planet Earth Records is run by Records Collectors for Record Collectors. Year: 1969. Catalogue No. 45-40040. Side A: I'm A Better Man. Country: US. ENGELBERT HUMPERDINCK. B: THERE GOES MY EVERYTHING / THE LAST WALTZ. RARE OZ PIC SLEEVE 7" EP - SMASH HIT! Scratches and surface wear. Label may have major markings, stains, minor tears, writing or stickers. Engelbert Humperdinck - The Way It Used To Be. Label: Decca. Year: 1969. Planet Earth Records is run by Records Collectors for Record Collectors. Side B: A Good Thing Going. Side A: The Way It Used To Be. 4X ENGELBERT HUMPERDINK 7" VINYL SINGLES. VINYL - ALL IN VG/EX CONDITION. Ten Guitars. EXCELLENT (EX). VERY GOOD (VG). When you receive your. The Shadow Of Your Smile. Delays do occur. Failure will result in item being re-listed. IF YOU ARE BUYING MORE THAN ONE ITEM. Title: Engelbert Humperdinck. Artist: Engelbert Humperdinck. Format: Audio CD. Release Date: 2000-05-22. Condition: Good. Product Details. THE LAST WALTZ. ORDERS WITHIN AUSTRALIA (EXCEPT VICTORIA) FOR ORDERS OUTSIDE AUSTRALIA TEN GUITARS. FOR ORDERS WITHIN VICTORIA THERE GOES MY EVERYTHING. Engelbert Humperdinck. Greatest Hits. And a few bits for the kids too. Not quite what you are looking for?. ENGELBERT HUMPERDINCK. The Last Waltz. HIGH ON MUSIC. Dedicated to the resurrection of the 45 & 33. Kangaroo Flat, Bendigo 3555. 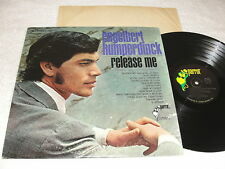 ENGLELBERT HUMPERDINCK ,A MAN WITHOUT LOVE ,12" 33rpm VINYL LP RECORD .1968 . A man without love Up, up and away. Decca records. Record No. SKL 4939. From here to eternity What a wonderful world. Engelbert Humperdinck - The Last Waltz. Label: Decca. Side A: The Last Waltz. Planet Earth Records is run by Records Collectors for Record Collectors. Year: 1967. Catalogue No. (I do not have a record player anymore, although I did have one when I was a teenager so I have a decent idea of what I'm saying with regards to the condition of the vinyl :) VINYL IS VISUALLY GRADED. ENGELBERT HUMPERDINCK. The Last Waltz / That Promise. Dedicated to the resurrection of the 45 & 33. HIGH ON MUSIC. All records are cleaned and sent in a new plastic outer cover. Original single released in Australia on the Decca label from the 1960s. Artist: Engelbert Humperdinck. Side A: The Last Waltz. Very Good. Minimal light scratches, scuffing and wear, however will not affect playing of record. 7" Single 45 rpm. Vinyl Side A: VG/EX. Vinyl Side B: EX. ENGELBERT HUMPERDINCK. THERE GOES MY EVERYTHING. THE LAST WALTZ. VINYL RECORD DE TAILS. Minimal light scratches, scuffing and wear, but will not affect playing of the record. GRADE VINYL SIDE A. GRADE VINYL SIDE B. Record Condition : See Item specifics - Sleeve Condition : See picture. SIDE A: Engelbert Humperdinck "The Last Waltz" - Australian pressing - 45rpm vinyl 7" record. SIDE B: That Promise - DECCA - Y 7369. (Vinyl is in VG condition. Supplied with factory paper sleeve). For double LP – count as 2 LP, for a box depends on the weight. Most of my records are in near mint condition and sounds beautifully. ---REST OF THE WORLD: 1-2LP/12”, EP/10”, or 1-4 CD, or 1-6 cassettes.